Incentives and Installers – Renewable Heat Now! 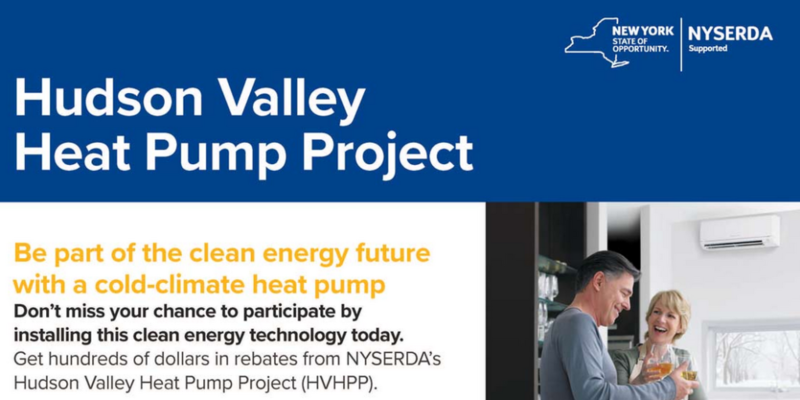 Funded by the New York State Energy Research and Development Authority (NYSERDA), the Hudson Valley Heat Pump Program is a unique opportunity to have unbiased, third-party technical experts oversee the sizing, design and installation of an air source cold climate heat pump in your home, including real-time monitoring of your energy usage. The program combines available incentives and includes an additional discount on Mitsubishi *air* source heat pumps (Note: these are *not* ground source heat pumps, but a widely used device that is installed in your wall and efficiently heats, cools and dehumidifies). This year, up to 15 homeowners will have an opportunity to realize substantial energy and carbon savings on a first come, first served basis. Sign up here. Air-Source Heat Pump NYSERDA Participating Installers [PDF] – Air-source heat pumps use the difference between outdoor and indoor air temperatures to keep your home a comfortable temperature all year round. Recent technology advancements in air-source heat pumps have made them a strong alternative for space heating in colder regions like New York State. In homes heating with oil and propane air-source heat pumps can save money on energy bills and lower your carbon footprint. Ground Source Heat Pump Rebate Contractors – Participating contractors can install a ground source (“geothermal”) heat pump system and submit all paperwork to NYSERDA for your rebate.